So much happened in April. So much. I decided to focus on all the good things, mostly family, friends and celebrations. We kicked off April with Holi celebrations at Boulder Balvihar. Not my favorite festival but I do enjoy taking pictures of everyone else, especially the little ones. I have never made puran poli, the sweet treat that is traditionally made for Holi. I wanted to but since my plate spilleth over, I put it on the back-burner yet again. I didn't make thandai either, even though we had really enjoyed it last year at this time. And, you know what? It didn't matter. That's not to undermine the importance of food during festivities and the stories that go hand-in-hand; instead it's more like celebrating on our terms rather than doing all the right things and being miserable as well as stressed at the same time. The special Holi prasad at Boulder Balvihar more than made up for all the fun treats that I did not make. Some of my friends really get into the act! April is special to us for another reason. We celebrated our seventeenth wedding anniversary with as much pomp as our wedding -- none. It's always a quiet day spent with each other, with lots of quality time and this time, a photo shoot. I'm always taking pictures, with my phone or my little camera or my Nikon. But these pictures can't be called family pictures because I am usually not in them. I changed that trend in 2012, and when I read this beautiful post, I was glad I did. It wasn't so much the "looking fat" bit as it was what each member of the family sees and feels when they look at a family picture. April marched on, and with it came the promise of a girls-only weekend in the mountains with Jaya. It was the first time we were meeting and the thought that we might be stuck with each other for a weekend did occur to us, especially if we weren't as charmed by each other IRL as we have been online. But we hit it off like the old pals that we are. She is just like the voice that comes through in her blog, grounded, down-to-earth, gentle, caring and most importantly, very sane. I was very happy to be able to cement our friendship with this weekend getaway. I showed Jaya around Boulder, making the pilgrimage to Chautauqua Park, including lunch at the newly remodeled Dining Hall, followed by tea at The Boulder Dushanbe Teahouse. We spent Saturday in Rocky Mountain National Park where it was brutally windy and the trails very icy. There wasn't much scope for a hike, despite having poles and snowshoes but we had a blast regardless. Especially fun was driving back to our cabin after libations at the Stanley Hotel in what started off as a drizzle, but quickly morphed into a near white-out when the rain turned to sleet and then into heavy snow. The girls-only weekend ended a little too soon but we parted with promises of doing this again. Maybe even in flat Texas! We have had typical Colorado spring weather in April. It has flip-flopped from summer to winter, with a snowstorm almost every week. Jaya was lucky enough to visit me in wonderful weather, between two spring snowstorms. This was what my front yard looked like the day after she left. Yes, we had over 14 inches of snow and our children still went to school. No wimpy East-Coast-style snow days for us. The kids weren't happy, of course, as it was just the kind of snow they need to make snow-people of all shapes and sizes. The high-schoolers couldn't have cared less (#petpeeve: it is NOT could care less) about the snow but they did care about their precious sleep. Instead they created memes about the school district and its aversion to declaring snow days. In between that last storm and the next one, I met Geneva, the winner of my pressure cooker giveaway. It was a very happy meeting! I've known Geneva for the past several years through Flickr. Our love for where we live, the mountains and spectacular sunsets brought us together. I have met her a couple of times before this, but only briefly. Geneva sets up an elaborate party along the route of the 10K BolderBoulder and I make sure to stop to get warm hugs before running off -- erm, jog-walking -- to the CU Stadium for Memorial Day festivities. Geneva has just started her cooking journey with a pressure cooker and winning the IFR Giveaway couldn't have come at a more opportune time! Congrats once again, Geneva! The next spring storm saw us rushing to Nissi's (warning: background music on this web site), a local music venue for live music and good food, to listen to high school Jazz Band Combos. It was great to see how far they've come since the beginning of the school year. Medha's combo kicked off the first night with catchy tunes and great improvisation. We returned the next night to listen to the seniors take the stage for their last Jazz performance outside school. It's amazing how much talent these kids have. There was a lot of food in April, too. I cooked a lot, tested recipes for a couple of friends, went to not one but two food swaps on the same day. The recipes I tested were very flavorful but I am not at liberty to share them yet. I can, however, share the recipe for a salad that was quite memorable. When Jaya visited me, I made this delightful cashew carrot salad, from a recipe I found in the Food Network magazine. The more I looked at it, the more it reminded me of my gajjarachi koshimbir. The carrots are shaved, not grated; peanuts are replaced by cashews; a dressing takes the place of a tadka or phodni, and therefore it has no mustard seeds or hing. I wondered whether our Maharashtrian koshimbir was the inspiration for this salad. If it was, there was no inkling of it in the magazine. Isn't it funny how we, as bloggers, must cite our sources and our inspiration, as well as link to it if possible, but magazines that hire recipe developers are under no such obligation? Of course, I could be totally off-base and this might be the work of some genius. No, really, because it is a fabulous salad. Make it. Gently shave the carrots with a vegetable peeler. Blend together cashew pieces, oil, green chile, lime juice, water and salt until almost smooth. Pour over shaved carrots and toss. Garnish with cilantro and some cashew pieces and serve as a refreshing side. Pretty to look at; delicious to eat. The FN recipe uses salted roasted cashews. I prefer to use (raw) unsalted cashews because they grind down to a creamier paste than roasted cashews. If soaked, the cashew paste is even creamier. As for raw, that's another pet peeve. What are called raw cashews in the western world are not really raw because they have been exposed to heat and steam to remove the toxic outer shell. They are not roasted but they are certainly not raw! Grating the carrots is quicker and it does not compromise the taste of the salad at all. It doesn't look half bad either. Start with 2 tbsp of lime juice. If you are like me and prefer it tart, add more lime juice. I add a whole green chile, sometimes two. It depends on who's joining us for dinner as well as how much heat the chiles pack. If, after tossing the carrots with the dressing, I feel that I would like more zing, I add thinly sliced green chiles with the cilantro. Grated, not shaved; but just as delicious. This is sooo inspired by the traditional Koshimbir!! think I'll make some for Dinner tonite. thanks! Yes it is as inspired a Marathi koshimbir as the curd rice with cashew and the glamor! Hey but it looks lovely like a vibrant orange fettucine with cashew pesto! No? My peeler makes very thick ribbons that were difficult to eat, so I might grate next time. I am still to try the cashew dressing (I subbed with peanuts and that is not quite the same thing). Hi, Jaya! I envy the two of you your time together! 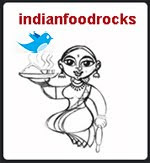 Manisha, have you been testing recipes for a food blogger's cook book?! Wow! Congratulations on your 17th! Taking family pictures, yourself included is a good idea - I should do it too. Soon , the son will be off again - who knows for how long this time! I am not getting emails anymore...do I need to sign up again? Niv, I thought so, too. I hope you enjoyed it! Anjali, ha! ha! I'm not into calling foods by names of lookalikes, especially to make people feel that they are familiar, but that's a good one! Anita, you might be making the same mistake I made. You have to *shave* the carrots, not peel them. The first time, I had thick peels. Jaya can confirm! So she grated the carrots for me. With a very light hand, gently shave the carrot in long quick swipes. I shaved these with a regular peeler. Anna, I switched from Feedburner to MailChimp and I deliberately did not set it up to send out an email for every post because people started reporting the very emails they signed up for, as spam. I know. So, instead, I send out a newsletter type email where I bunch a couple of posts together. I should have that in the works by tomorrow. There are a couple of ways to get informed of posts right away. Use Feedly to subscribe to my RSS feeds or follow the IFR page on Facebook. I'm sorry about this but I didn't want to labeled a spammer because of repeated complaints. I have been following ur blog for more than a month now. I am sure it feels nice to document experiences. I love to cook n take snaps but m not so easy with words. I did read the beautiful link u posted here n I am now inspired to take as many fotos of me WITH family! Shreya, welcome to the fun at IFR! I think we each have our own ways of documenting our experiences. It's wonderful that you have found expression through your love of food and photography. Photos don't need to be perfect to be precious. For example, this collection of photos of four sisters over 36 years is quite incredible even though it isn't necessarily a tutorial on portraiture. I'm so glad you are now in the frame! Vaishali, thank you! It is delicious, yes! I hope you try it! Really enjoyed your post and the pictures. Felt like I was there almost...and a lovely healthy recipe to boot. Yum. I often make your older carrot salad with peanuts. Thank you Manisha .